Hollywood action star Steven Seagal joined President Rodrigo Duterte in a visit to Camp General Teodulfo Bautista in Jolo, Sulu. 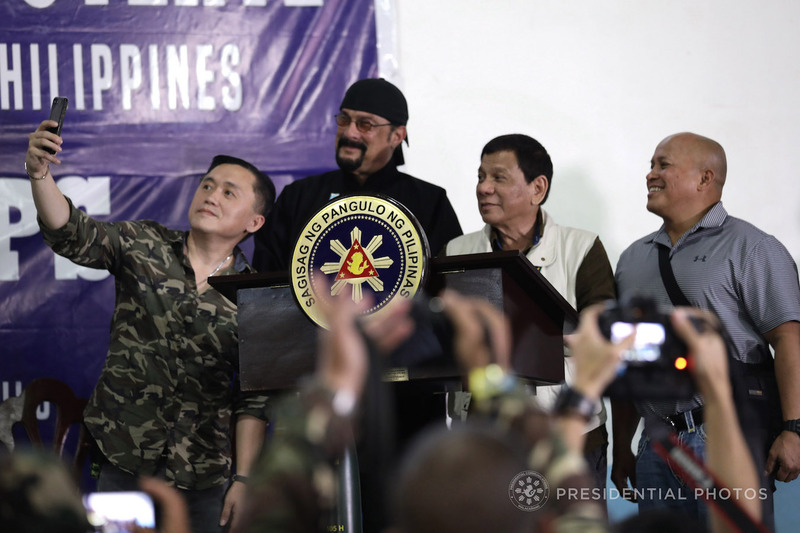 The star of 80s and 90s sought to boost the Philippine military’s morale by telling soldiers their wars are “winnable,” though it will take time. 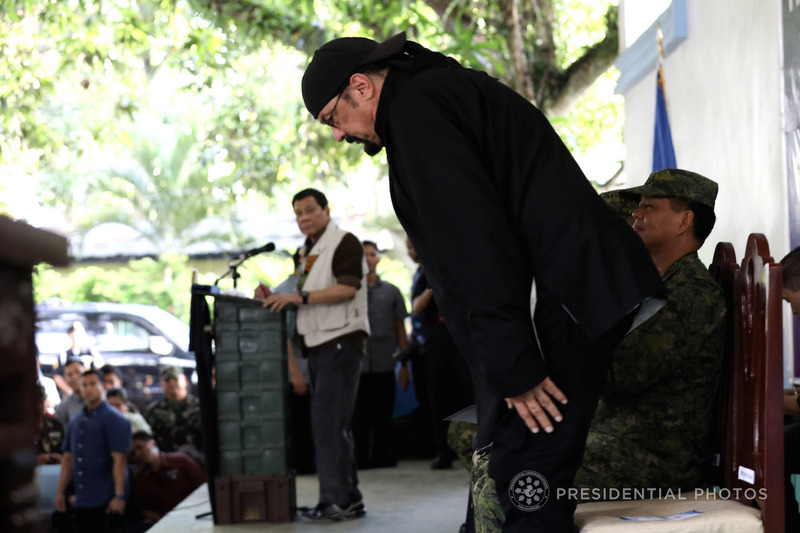 President Duterte paused his speech to allow Seagal to share “inspiring words” to the troops. 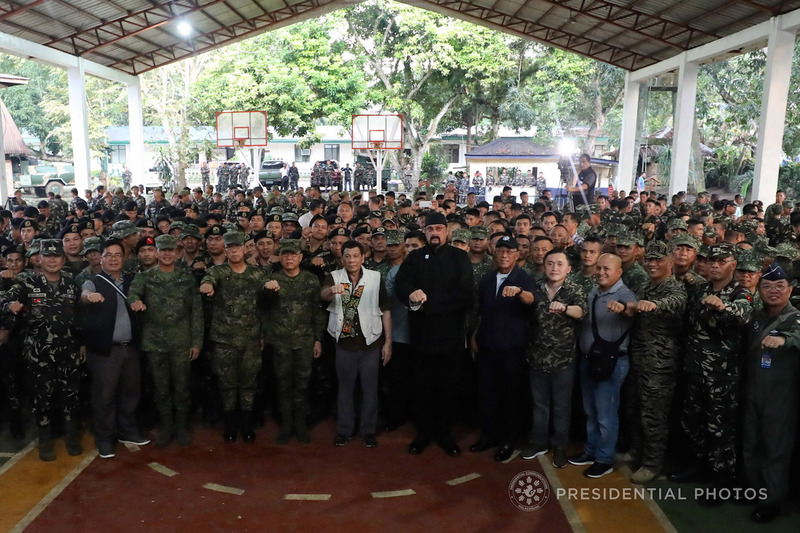 “I understand that this is serious business and I believe there is a formula that can help the Armed Forces, the police, the intelligence network, to combat this very well,” he said. 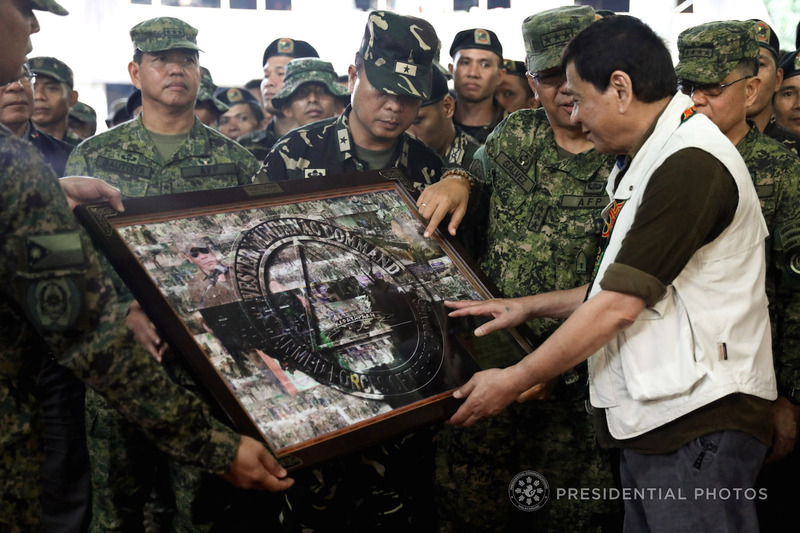 “I am looking forward to discussing these things with President Duterte at a later time,” he added. 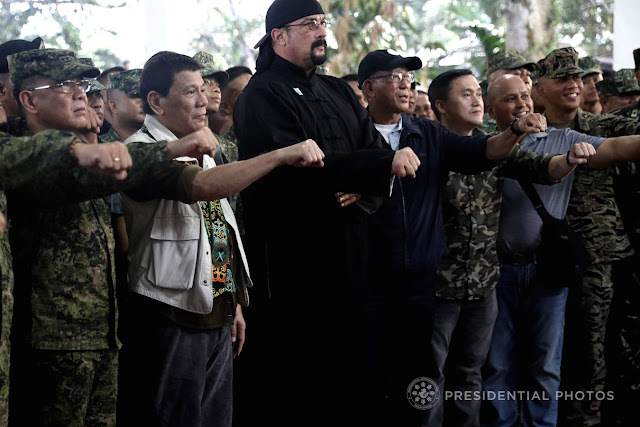 Seagal said soldiers should remember their battles will not be won today or tomorrow. “It’s gonna be a long fight, but the idea is to annihilate the enemy through attrition. 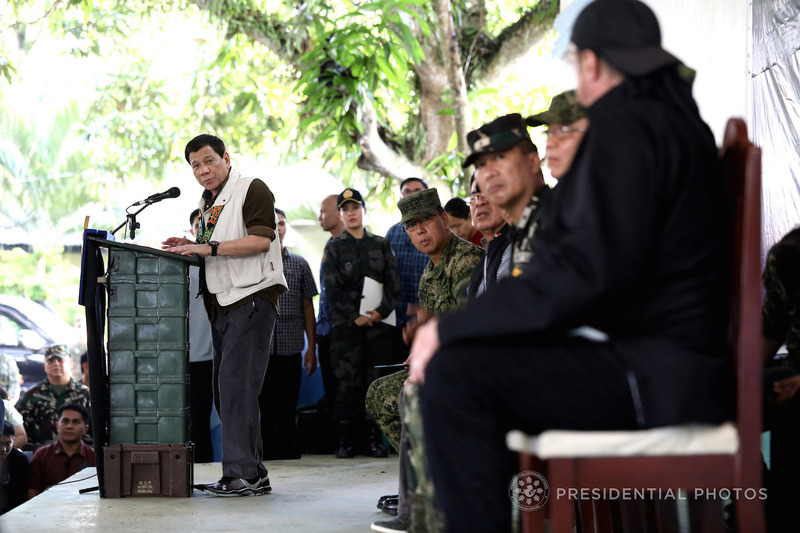 It’s gonna be a long battle, but slowly, day by day, week by week, month by month, year by year, the enemy will get smaller and finally they will be gone to the point where it is absolutely and positively controllable,” he said. “I know you guys put your life on the line every day. I myself have done and will do the same thing so I understand this is serious business,” he told the soldiers, who have been battling Abu Sayyaf for decades. “I hope I can be involved with all of you in this war against all of these evil things,” he said. A beaming Duterte praised Seagal, telling the troops “he is a soldier so he is on the same wavelength with you when he talks”. 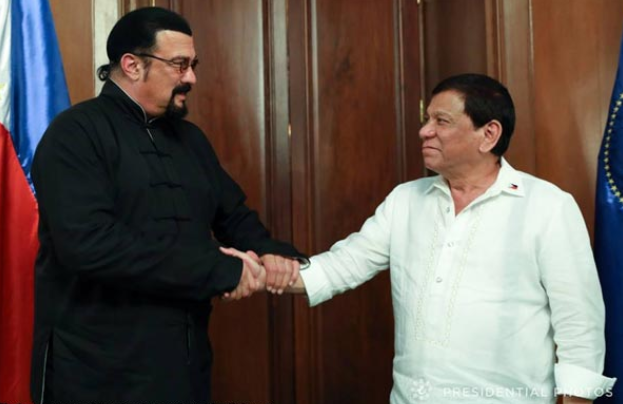 Seagal has previously praised Duterte for making the Philippines safer despite widespread criticism that Duterte is resorting to brutal, strong-arm tactics that have claimed hundreds of lives.